As the mild weather continued well into November, we enjoyed a mid-week stroll. We planned to catch a bus up to Colden for lunch at May’s but missed one by minutes. With a short window of afternoon sun, we bought pasties from the local bakers and strode rapidly towards town. I remarked we were going at a fair lick considering we had no aim in mind. I suggested going to Hareshaw Wood and we made our way up to Salem Fields. After crossing Foster Mill Bridge, we climbed the large cobbled steps and paused by the majestic sycamore to contemplate the glorious sunny scene. A friend descended the steps towards us and stopped for a chat. She asked if we were going to Heptonstall. 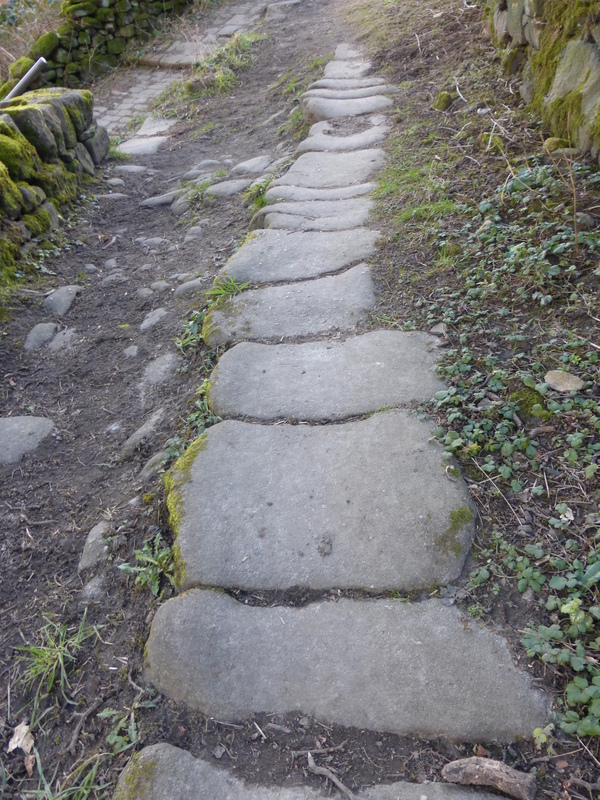 I replied that we had no definite plans but “’All roads lead to Heptonstall’ (as it says in my book)”. She laughed, and invited us to call in for a cuppa next time we ended a walk there. We turned right at the top to pass through Hollins. A rustling sound near my feet did not alarm me at first, assuming it was my boots treading fallen leaves. However, the noise did not match my pace. I looked down to find a daft dog sniffing at my heels, threatening to jump onto me. The owner seemed oblivious: strolling some paces back, busy gassing on her phone. I shouted repeatedly at the mutt until the owner overheard and called the animal off. We chose to go upwards through the wood which we rarely do. Interesting colours strew the path, with lichens and fungi dotted amongst the autumn foliage, some sprinkled with perfectly round dewdrops. At the top, we crossed Lee Wood Road and looked for the gap on the other side. Having thought we had spotted it, we made our way up worn shallow steps barely discernible beneath a thick carpet of brown leaves, indicating an ancient route. We crossed the road to continue, where more worn steps and a crumbling waymarker post gave further clues to its history. Hesitating briefly as it was not Tinker Bank Lane as we had expected, we reasoned that it must be nearby. I found the last part of steep climb very hard work. We caught our breath near the top where a fowl enclosure stood to our right. Disgruntled geese flapped their wings, perturbed by our presence. 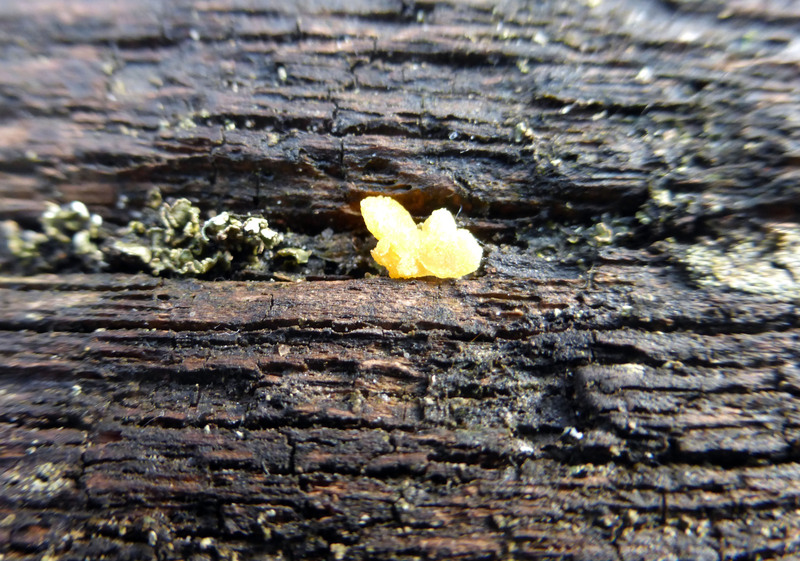 Tiny orange mushrooms grew in a clump from a hollow in a tree. A wooden signpost gave directions to various locales from which I guessed we had somehow come up a parallel path to Tinker Bank Lane. This assumption was confirmed as we made the last bit of the climb alongside the octagonal chapel. Now in Heptonstall (which, as I pointed out to our friend earlier, was inevitable), we continued along Northfield. An almost blank yellow sign amused us with only the word ‘Please’ discernible, albeit faded. We guessed it had once warned against parking before the letters had peeled off. Over in the churchyard we sought a patch of sunlight to sit in and settled on the church steps facing south. After eating my pasty, I foraged for interesting leaves that had collected round the Victorian gravestones. With only an hour till dusk, we made a quick return via Eaves Wood. At ‘photographer’s corner’, the Stoodley Pike monument and wind turbines rose from a blanket of grey, topped by artily-arranged lenticular clouds. We joked about the ‘mistical valley’ (which became the subject for the next Monday Morning haigai. Descending the steps at Hell Hole Rocks, a man waited at the bottom and asked us if he was on the right track for Heptonstall. I confirmed that he was. Further down, we watched squirrels scampering amidst the tree branches, gathering nuts. My wildlife photography proved as pathetic as ever! Back home, I felt pleased that we had got out for some fresh air and exercise, in spite of my extreme tiredness and achy legs necessitating a lie down. This entry was posted in heritage, landscape, photography, walking, woods and tagged anxiety, autumn, branches, bridge, Calder Valley, Calderdale, church, Churchyard, clouds, cobbles, colours, dog, dusk, Eaves Wood, England, fatigue, foliage, food, Foster Mill Bridge, fungi, geese, graveyard, haiga, Hareshaw wood, Hebden Bridge, Hell Hole Rocks, Heptonstall, heritage, Hollins, landscape, leaves, Lee Wood Road, lenticular clouds, lichen, lunch, Methodist chapel, Mushrooms, nature, November, octagonal chapel, phone, photography, post, Salem fields, seasons, sign, signpost, sky, squirrel, St. Thomas A Becket, steps, stone, Stoodley Pike, sun, sunlight, sycamore, Tinker Bank Lane, Tinker Bank wood, trees, twilight, Victorian, views, walking, waymarker, wildlife, wind turbines, woodland, woods, Yorkshire on November 27, 2018 by Hepdene Rose. On the final Saturday of April, we had arranged a walk and lunch with Marisa. I started the day feeling tired and a slightly ill but well enough. 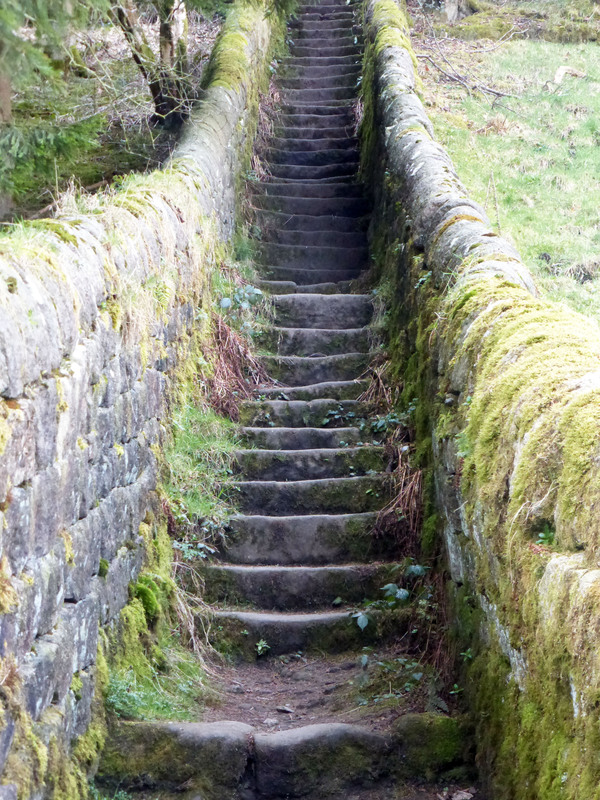 The weather (cloudy and changeable) made us reluctant to go far and she suggested a different way up to Heptonstall. A walk across town and over Foster Mill Bridge took us to the steps leading to Hollins. Pausing to catch our breath, we admired the bark and twisty branches of a wayside sycamore tree. We continued through the hamlet and entered Tinker Bank Wood. We kept to the pretty lower path where luscious grass was interspersed with clumps of bluebells. Stepping over the tiny stream, we came down alongside Hebden Water and climbed up a rough track. We arrived at a massive farm which appeared to be being converted into a horsey holiday camp. They also had a rather impressive if alarming collection of military vehicles! Are they getting ready for a post-Brexit Britain? We climbed the long flight of stone steps to Bobby’s Lane and had to rest at the top before continuing. Walking eastwards to the next junction we took left turn. Picturesque old stones underfoot and a variety of tree life either side provided plenty of interest. We emerged at Lee Wood Road where we crossed and examined the marker post before ascending up of Northwell Lane. This gave us great views across the valley and eventually led to Heptonstall. In the White Lion, we supped pints and had fun reading the place mats (mine had the grim tale of a murderous Coiners plot) while awaiting our food. We agreed on a quick way back home and detoured through the village to locate the village stocks opposite the old co-op yard. 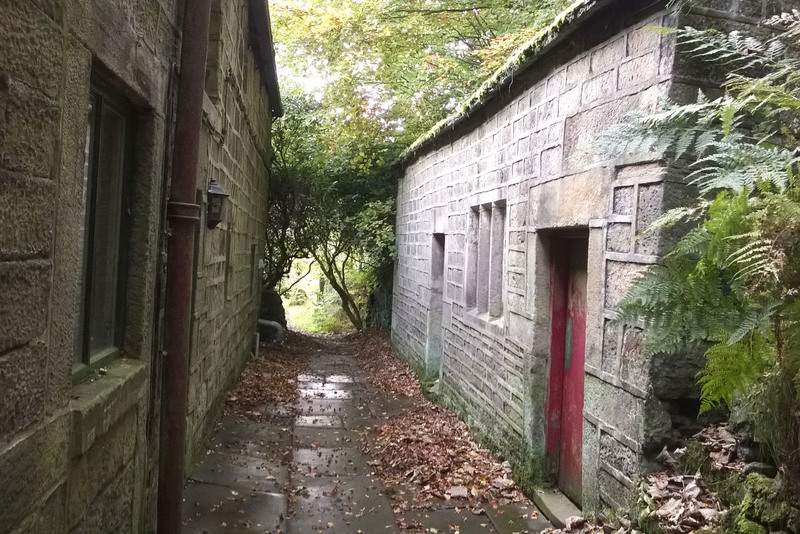 Marisa showed us the ‘Corpse Road’ which travels parallel to Heptonstall Road. I had been unaware of this path although I worked out that we had taken various parts of it previouslyi. Again, we admired different views down the valley and varied plant life including a wild cherry tree, while avoiding the muddy spots. We spiralled down to the bottom of Eaves wood, noting the old stone carved with the initials ‘W.G.’. On Heptonstall Road once more, Marisa invited us in for a cuppa but I had become very tired and slightly unwell. We walked her to her front door and commented on her tidied up garden, said our goodbyes and returned via the Cuckoo Steps. This entry was posted in heritage, landscape, photography, walking, woods and tagged bark, beer, bluebells, Bobby's Lane, branches, Brexit, cherry, co-op, Cragg Vale Coiners, Cuckoo Steps, farm, Foster Mill Bridge, hamlet, Hebden Water. track, Heptonstall, holiday camp, Hollins, Lee Wood Road, Northwell Lane, path, photography, spring, stocks, stones, sycamore, The White Lion, Tinker Bank wood, trees, village, woods on May 2, 2017 by Hepdene Rose. Early May, signs of spring finally emerged. We took a fast route upwards through Eaves Wood in the bright sunlight, barely stopping to admire tiny flowers and catkins along the dry path. At Hell Hole Rock, we saw a group of campers around the embers of a dying fire. One of them waved to us. Phil laughed at them having a festival. I remarked it wasn’t a festival but they had probably been there all weekend. When we reached photographer’s corner, I braved the ‘desire path’ to the overhanging crag in pursuit of good shots across the valley. However, my efforts were thwarted by haze. I felt very hot and tired from climbing up the steep steps. I decided that my original plan to reach Hardcastle Crags via an untried route was too much in the heat. We sat awhile on one of the flat rocks, sipping coffee and enjoying the scenery. We then proceeded into the neglected part of the wood (Slater Ing Wood according to Phil’s phone app). It looked less dank than on our previous visits with lush green vegetation, bluebells and other woodland flowers amongst the dead trees. We ventured off the main path to find a suitable rock for a picnic. Two dogs rushed by and we kept our food hidden until they had gone. Whilst eating, we examined the features around us including tiny detritus from the nearby trees and the patterns in the rock we were sat on. Lighter stripes could be seen where fallen sticks had been dislodged, exposing fresher greenery underneath. We then continued on the usual route to Heptonstall and noticed a posh new sign proclaiming the entrance to the village. In The Cross Inn beer garden, all the sunny spots had been taken. The main attraction was eating burgers off the grill, although kids playing in a toy taxi provided amusement. 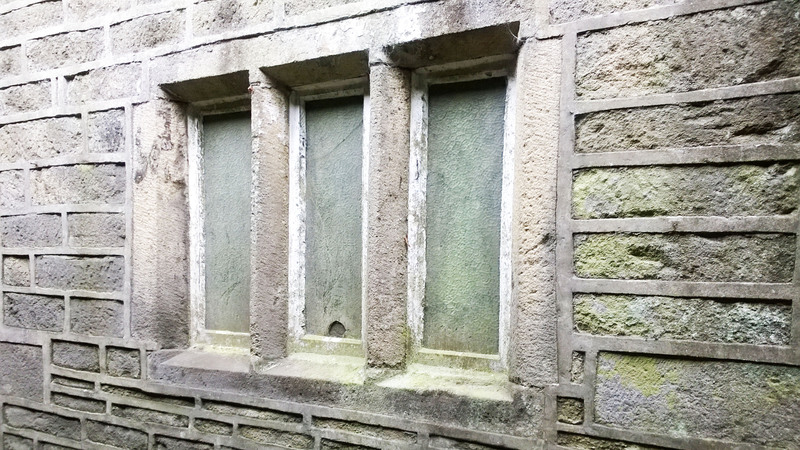 We walked out the side gate and down the path at the side of the octagonal chapel onto Tinker Bank Lane. Guinea fowl on the path scattered as we approached. I spotted a fallen tree branch forming a low arch (which I had not noticed last time). At the end of the lane, more bluebells were found. We crossed Lee Mill Road into Tinker Bank Wood to admire yet more bluebells and a strange branch on the ground with apparently seven trees growing from it. We proceeded through Hollins, down onto Foster Mill Bridge and into town. It was still too nice to go home so we stopped at Oldgate for a second pint. As I went to the bar, Phil sat at the end of the wall opposite by the riverside. We enjoyed the evening sun soon to disappear behind the rooftops. I was just polishing off my beer when I heard a splash and Phil exclaimed ‘oh bugger!’ He had dropped his phone in the river! After some consideration, he decided he had to get it. 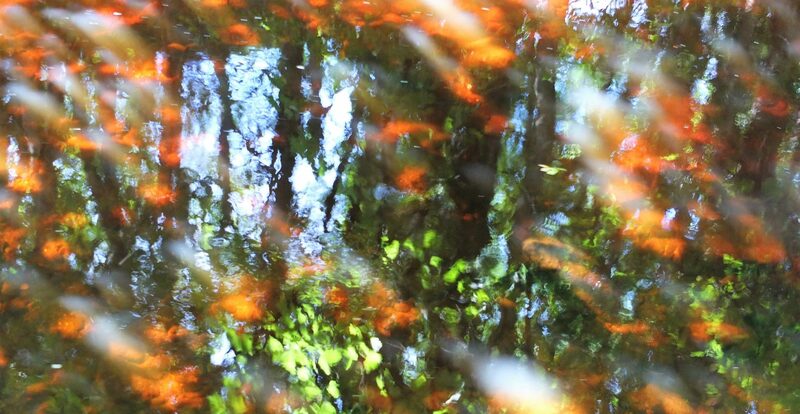 He walked to the packhorse bridge, over to the other side, down into the water and waded across to retrieve it. He looked very calm and relaxed about it. I gestured to him to indicate the location of the dropped phone and suggested he took a shorter route back. Miraculously, the phone still worked! A fine recommendation for the British Wiley Fox company. We laughed about it all the way home. This entry was posted in landscape, photography, walking, woods and tagged Calder Valley, clough, England, flowers, Foster Mill Bridge, Hebden Bridge, Heptonstall, Hollins, path, photography, rocks, seasons, Slater Ings, spring, The Cross Inn, the Oldgate, Tinker Bank wood, trees, valley, walking, woods, Yorkshire on June 10, 2016 by Hepdene Rose. On a rainy Sunday in October, we ventured out to explore lesser known woods close to home. A steep climb up Moss lane led to a turning on the right and through a gate onto a small path. The grey paving, now slippery and worn, hold testament to its past as an old road. Navigating gingerly as the overgrown path stepped downwards, before widening into a ‘lane’ banked on one side by a moss-covered stone wall. We noticed several cobbled paths leading off up the hillside. These, together with the buildings that remain, make it easy to imagine this hidden enclave as a village in days gone by. Proceeding to a fork in the way, we headed up to Hareshaw wood until we came upon a ‘stone circle’. We then realised we had traversed into Tinker Bank wood. We considered carrying on going west but the path appeared overgrown and the rain returned. Instead, we doubled back to the fork and took the downward route from there. This led to a very narrow path between allotments. We navigated carefully past a large tree whose roots served as steps down, to get onto the riverside path. 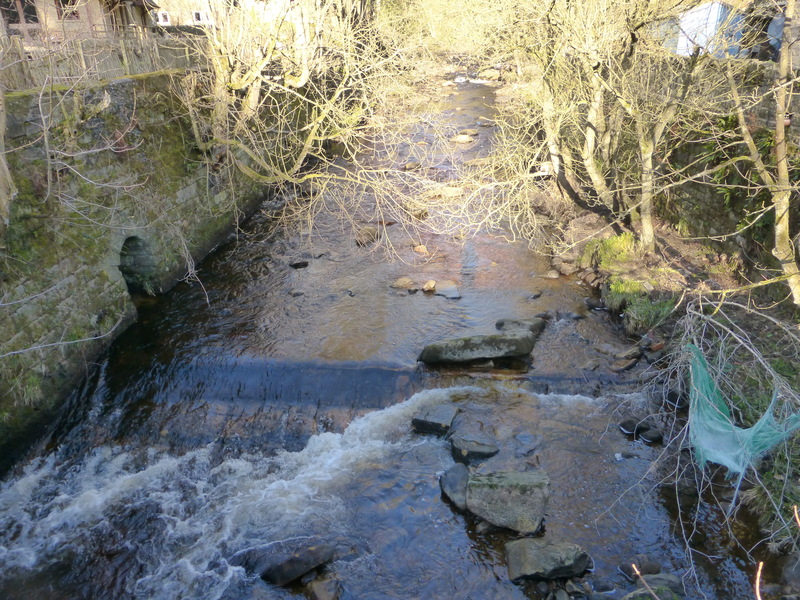 We marvelled at the changing flow of Hebden Water. After a dry summer, recent rain had brought more trees down and the river itself appeared to have shifted to the north with a new waterfall forming. We revisited Hareshaw woods in the spring. This time, we followed the lower path that had been blocked in autumn. It emerged near the river just beyond a bowling hut. We carried on up the lane to a posh farm. The way ahead being marked private, we took a flight of steep stone steps up to Bobby’s lane. From there, we carried on passed the Blue Pig and onto the edge of the crags. We rested on a bench and examined the miniscule plant life in the cracks of the picnic table whilst trying to fend off all the dogs. We then returned via the riverside path. At the bridge where we normally crossed, we decided to stay on the east side for a change. 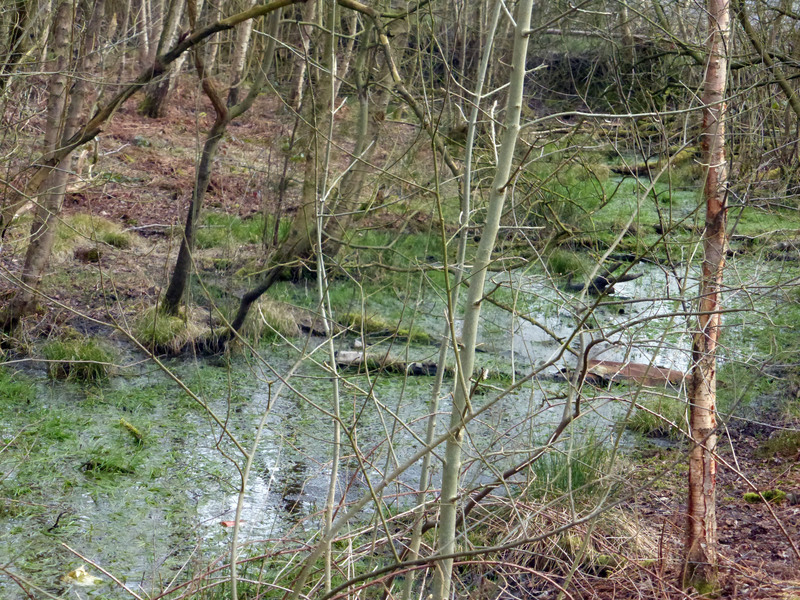 It took us passed what looked like a swamp full of rubbish – not very pleasant. We came out at Windsor View and went into town. A year on, I had been mostly inactive for two months due to illness. The brightening sky with its promise of better weather lured us outdoors. I found the walk up Moss Lane hard work but persevered. We took the now-familiar right turn towards the old road and again mused over the old buildings and causey stones. Although patches never saw sunlight and walls dripped with water and damp-loving plants, a crust had formed over the mud making it easy going. In Hareshaw Woods, we remarked how different it looked from last time we had visited. 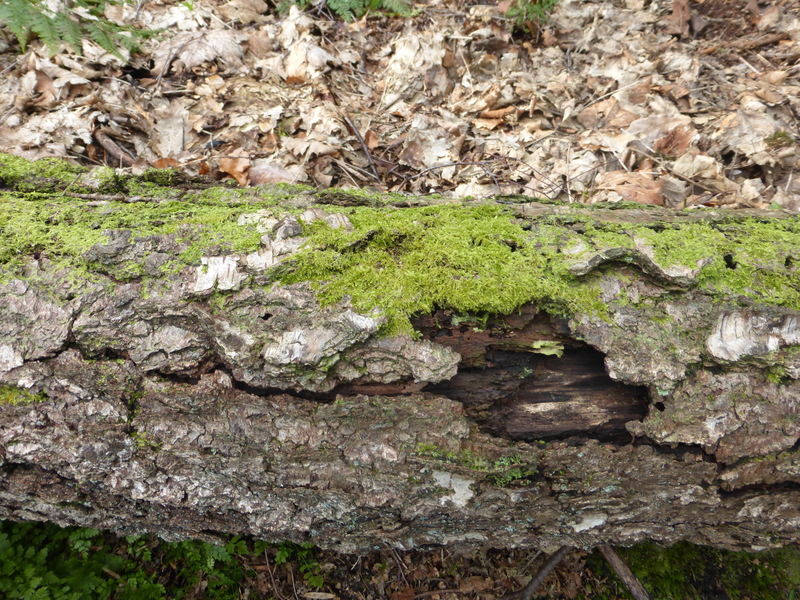 We discovered a variety of mosses and lichens and interesting holes in dead tree trunks. I tried to find the ‘stone circle’ we had discovered on our first visit but to no avail. We carried on further along the path above the bowling hut. 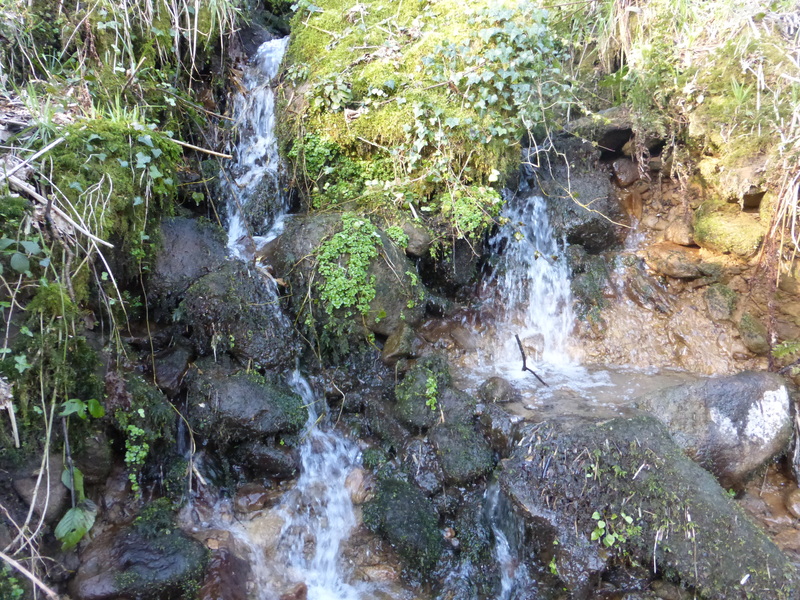 We crossed over a gorgeous little stream, where mini waterfalls tripped over higgledy piggledy rocks. I surmised that this had been created in the recent floods. Continuing, we came down onto a paved road near a group of chalets. This ‘little Switzerland’ is a rather odd do – someone obviously had a dream and built it. We crossed the river via a bridge with white railings. I noticed an arch in the wall at water level and joked that it was the entrance to a smuggler’s cave. We then took the well-trodden route along Hebden Water towards Foster Mill Bridge. Again, changes had occurred, with much sand exposed on the northern banks of the river. An old tree stump I had been documenting for years looked as if it would not last much longer. 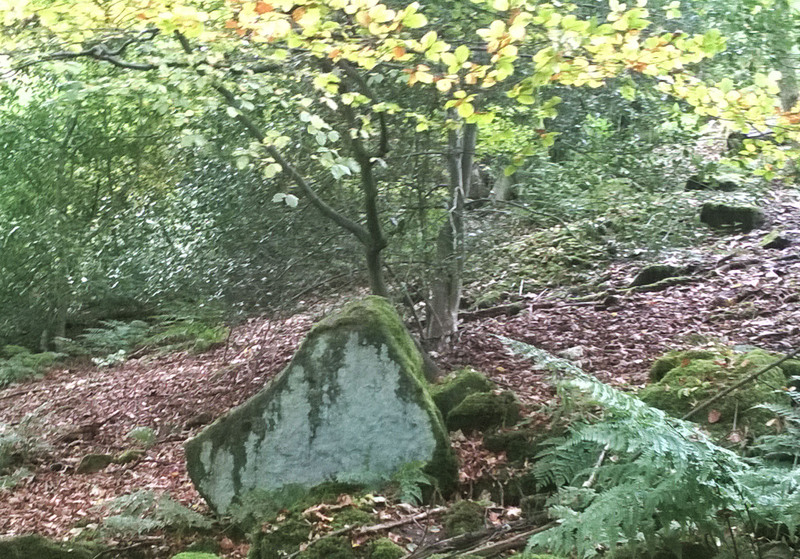 This entry was posted in archaelogy, landscape, photography, walking, woods and tagged autumn, flowers, Hardcastle Crags, Hareshaw wood, Hebden Bridge, Hebden Water, hills, moss, path, river, spring, stones, swamp, Tinker Bank wood, trees, walking, Yorkshire on October 21, 2014 by Hepdene Rose.